A San Francisco, California, streetcar plies Market Street, near the Embarcadero. Photo by danishdynamite. 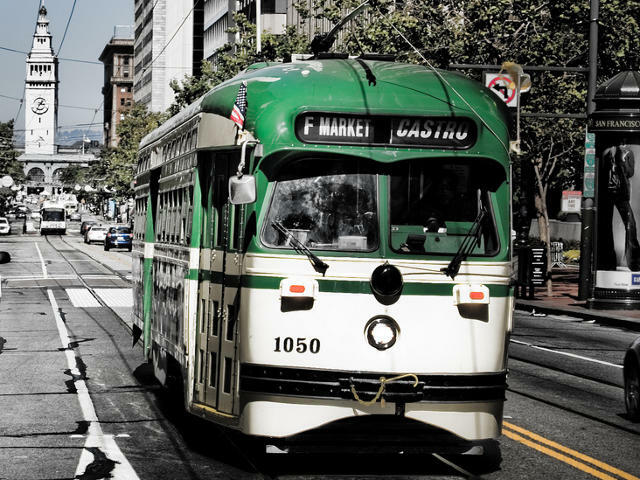 Picture yourself on a lazy Sunday afternoon cruising down San Francisco’s Market Street in one of the city’s iconic streetcars. You have a seat to yourself to peer out the window as the sun beats down over the Golden Gate; your car arrives at its destination (the weekend farmers’ market, of course) right on schedule, and you hop out jovially to go about your day. Now picture yourself in the same cable car, on the same street, at 8:30 AM on a Monday morning. It’s an entirely new experience: bodies press up against one another as the car stops to take on more commuters, making everyone on it late for work. The sights and sounds of your idyllic weekend are replaced with the horn blasts and traffic jams of an arterial road during commute hours. 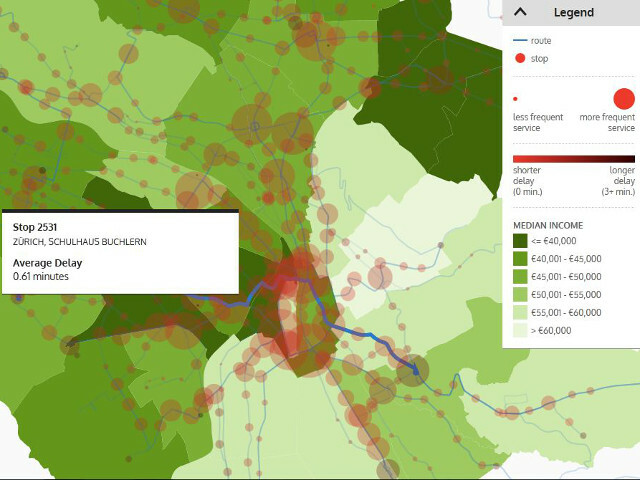 While city planners and officials regularly use data to measure things like ridership and congestion, they’ve yet to fully harness the power of data to communicate the human experience of using public transport. 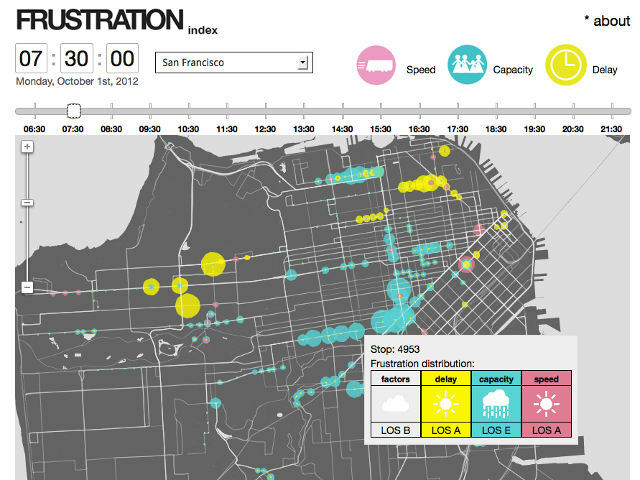 That’s why the San Francisco-based initiative Urban Prototyping partnered with the cities of San Francisco, Zurich, and Geneva to organize the first ever Urban Data Challenge. Working with transportation officials in each city, the Challenge gave participants access to massive amounts of raw data and asked them to create visualizations that made dense urban data sets more accessible — and more fun. Since announcing the winners in April, the Challenge has sparked conversation about how big data and participatory design can be woven into urban solutions. We at TheCityFix would like to continue this conversation by offering our thoughts on the biggest four lessons to come out of the Urban Data Challenge. Perhaps the Challenge’s biggest achievement was the way in which it allowed big data to speak to people. Transport data — i.e. who rides, how often, and where they go — comes from a variety of sources, including fare systems, rider surveys, and even GPS-enabled smartphones. Considering that the transport systems analyzed in the Challenge each serve nearly 500,000 riders per week, that amounts to a lot of information. Until recently, city officials had a hard time making any use of this data. However, recent advancements in the young field of data science have helped to re-associate the numbers with the experience itself. For example, the second-prize-winning, Frustration Index used data on delays, congestion, and crowding to visualize which routes exasperate riders the most. More than visualize the ebb and flow of transit ridership, the team of programmers and graphic designers was able to convey the human emotion behind the numbers. Pinpointing these problem areas is key for cities and service providers, who need to provide high quality service and avoid frustrating riders to remain viable. 2nd prize winner, Frustration-Index. By Urban Prototyping. Along with the growing field of data science comes its protagonist, the data scientist. The so-called nerds of yesteryear, these men and women are shaping the way society makes use of the data resources at its disposal. Data scientists unite many technology-oriented fields in their work, including statistical analysis, web development, graphic design, and more. One look at the Challenge’s jury, which includes data visualization experts, entrepreneurs, computer programmers, and tech bloggers, shows just how diverse and wide-ranging this young field is. The idea of crowdsourcing for ideas to improve urban life is nothing revolutionary in itself. However, what the Challenge shows is that this tactic is now evolving to harvest fully-formed solutions. Challenge contestants used the data provided to identify, analyze, and address important issues that city officials were previously unable to tackle. Take, for instance, grand-prize-winning project Dots on the Bus. Brother and sister Adam and Amelia Greenhall teamed up with web developer Jared McFarland with the goal to make public transport seem less intimidating. Their creation allows you to watch a day in the life of a major bus line in three minutes and highlights just how many people use public transport throughout the day. The team used cartoon-like design elements in an effort to turn users on the fun side of urban transportation. As the winners, the team received $5,000 from Fusepool to collaborate with city officials and develop an app that will make their visualization fully functional on mobile devices. Grand Prize winner, Dots-on-the-Bus. By Urban Prototyping. 4) Data … the final frontier? Despite the success of the Urban Data Challenge, the potential to leverage big data to improve the quality of urban life remains largely untapped. If anything, the most successful projects revealed more questions than answers. For example, second-prize-winning project Transit Quality + Equity originally set out to take the focus off of speed and efficiency and put it on the user experience of riding public transport. This path led them to focus their project on the disparity in access to transit between different ethnic and socioeconomic groups, which in turn led to questions of discrimination on public transport. Co-2nd prize winner, Transit Quality + Equity. By Urban Prototyping. Challenge contestants were not able to treat each of these concerns, and questions remain about the role of transport in people’s lives and and the best way to make transportation planning responsive to human needs. However, what the Challenge did reveal is that data can provide some of these answers. Specifically, it proved that the combination of open data and an engaged, technically equipped public can find these answers faster and communicate them dynamically. For this reason, big data and in particular open data looks poised to play a large role in transportation planning and urban problem solving as long as government officials are willing to cooperate. You can read more about the Urban Data Challenge and view of each of the winning projects and honorable mentions here. Friday Fun: Printing our buildings?